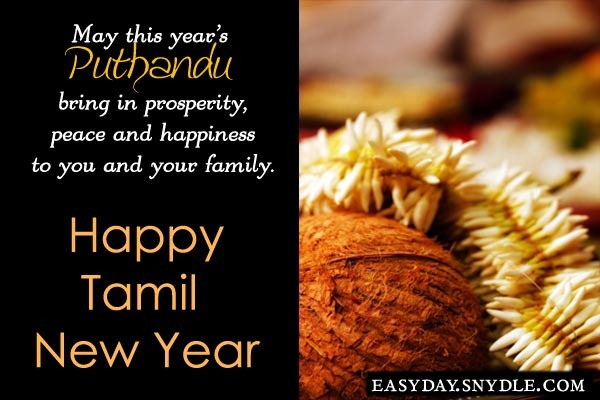 Puthandu, Varusha Pirappu or the Tamil New Year is the start of a New Year according to the Tamil Calendar. It falls each year in mid-April. 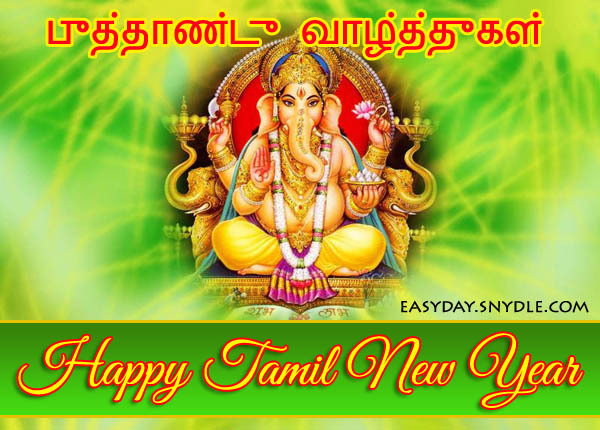 The usual Tamil greetings for the occasion are: Puthandu Vazthukal or Iniya Tamizh Puthandu Nalvaazhthukkal. 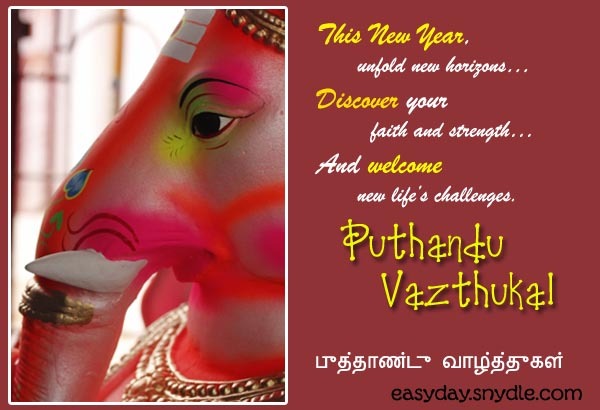 In 2014, Puthandu will occur on April 14 which is a Monday. In Tamil culture this day marks the first day of the first month – “Chitterai” which is none other than the Hindu calendar month of Chaitra. 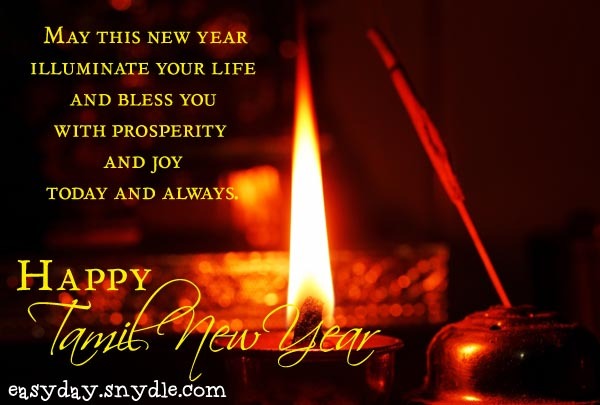 The dawn of a new year is celebrated with great fervour in all Tamil culture following families. The day is especially celebrated in the Meenakshi Temple in Madurai with immense grandeur. In many parts of South India, great exhibitions showing traditional Tamil arts and pieces of literature are held, homes are decorated very elaborately with flowers and Kolam. 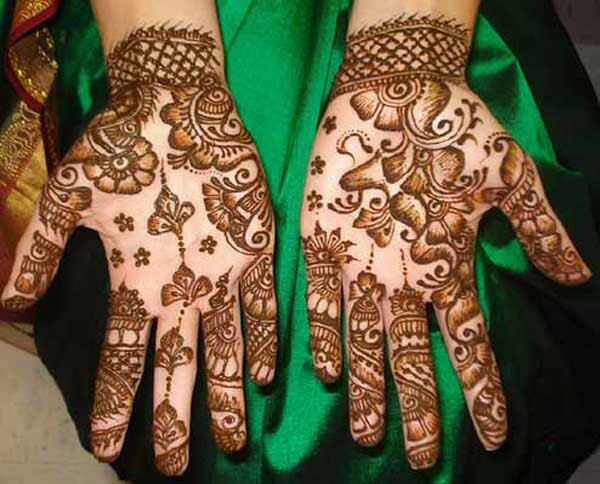 Since during this time Neem and mango trees are just beginning to bloom, Neem flowers and raw mangoes become a major part of the celebrations as they symbolize prosperity and progress. In Sri Lanka, the elders of the family inaugurate the first monetary transaction of the year by giving money as a token to children and unmarried adults. The first ploughing of the fields is done by farmers called arpudu in anticipation of a year full of bountiful harvests. The very entertaining game of por-thenkai or coconut wars is played by young men and cart racing also takes some of the limelight. This occasion marks the beginning of another year of hope and hard work for most Tamil families. Here are some messages to greet and wish people on this auspicious occasion. Here’s wishing a New year that is NEW in every sense. With new hopes and new beginnings and newer horizons to travel to. May the new sun bring in all the goodness in life. and welcome life’s new challenges. May you be blessed with true harmony, prosperity and peace that comes from above. I send my wishes for year-long happiness, prosperity and success. with overflowing fortune and joys! start anew at fulfilling your life’s dreams and don’t give up. May the Lord be your guide. May our Creator bless you with all of life’s goodness. I wish for you, lasting joy, deep contentment and true prosperity. I wish that it fills you with fresh hope. May Lord Ganesha shower his blessings and you realize your dreams! may each of your days be replete with cheer, new resolutions and success. celebrate past successes on this very special day. Joy, Prosperity, Success and Hope. and the lives of your near and dear ones. Make the most of life, starting on this auspicious Puthandu. Step into it with new hopes and dreams! Love, that it may smile upon you forever! Sound health, good fortune and a wonderful life. may you be blessed with health, vigor and passion. May your soul find joy and your mind a new way to life. Another Puthandu is on the way bringing happiness and success for you and your loved ones. Embrace life and all its goodness this beautiful Puthandu. Wish you true happiness and lasting prosperity on the occasion of this New Year. May it be filled with love, peace and hope for the year ahead. On the first day of the Tamil New Year. to make a difference and an opportunity to live your dreams. to spread the message of true love, lasting peace, fresh hope and pure joy. health and the Almighty’s blessings. DO you know what a New Year symbolizes? New beginnings and fresh hopes. 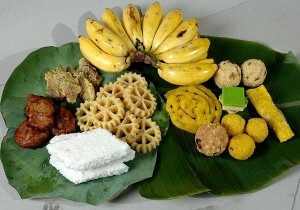 May this Tamil New Year bring all of this into your life and family. People, places and memories, these are what make life beautiful. Make this Puthandu the beginning to life’s most amazing days ahead. Our family wishes yours a happy and prosperous New Year. May it be full of celebration and joy. contentment and fulfillment for you. are full of happiness and hopes for a better future. Make this year count in making all your dreams come true. May the Sun dawn on a New Year reflecting the richness of life in the coming year. don’t forget the sharing of joy is the best offering to God. Share your joys and successes with those around you this coming year. and it brings with it opportunities to shine. I wish that you achieve success in all your endeavors this entire year. As you welcome the New Year, may the blessings of the Almighty shower upon you. May He bless all each month of this year with happiness and peace. May He guide you on the path of truth and humanity. 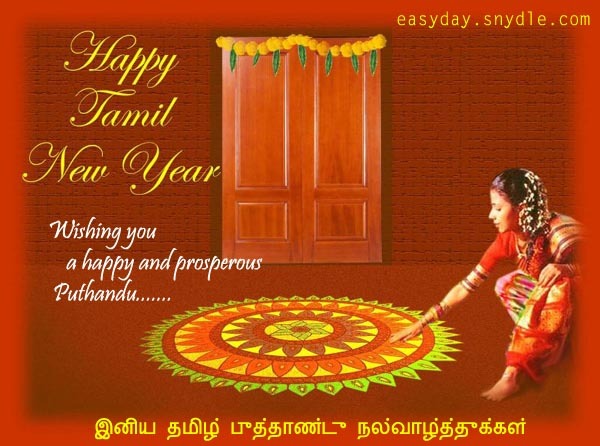 Happy Pothandu – Tamil New Year! I hope this Puthandu brings prosperity and peace to you and your family. Let us pray for enough strength to accept success and failure, and enough resolve to move on. This New Year’s day comes with a deposit of 365 days full of love, warmth and cheer. Enjoy each day of the New Year as it was made especially for you. These I wish for you on this beautiful day and year. and set foot towards new horizons. May this New Year be a new beginning. I hope your New Year is enjoyable and full of promise. May this New Year blend a gentle sweetness in your life that lasts forever! A New Year is a joyful time. This Tamil New Year, usher in freshness, dreams, truth, faith and trust. These will make the beginning of the new year, even more meaningful! Another year has gone by with its share of unfulfilled promises and unrealized dreams. resolve to change your future by fulfilling your promises to yourself. colorful lights, sparkling crackers and smiling faces. And usher in a beautiful life full of inner peace and resolve. and above all, lasting good health to enjoy the fruits of a joyful life. may the lucky stars shine upon your life. and may God bless you with wisdom and courage! My simple wish for a person as wonderful as you is that all your dreams come true. May you fulfill the role you were born to play in the Almighty’s plan. 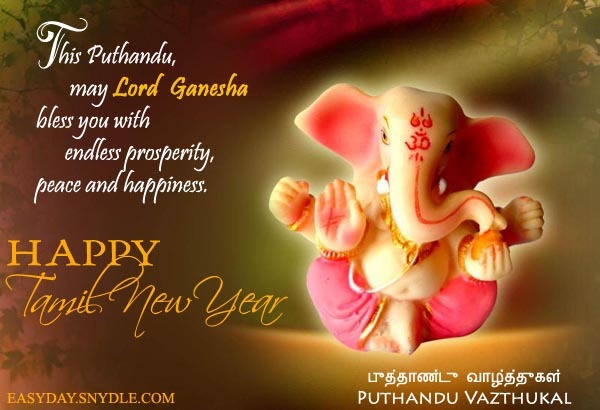 I hope this small compilation of Puthandu messages and greetings find favor in your sight. 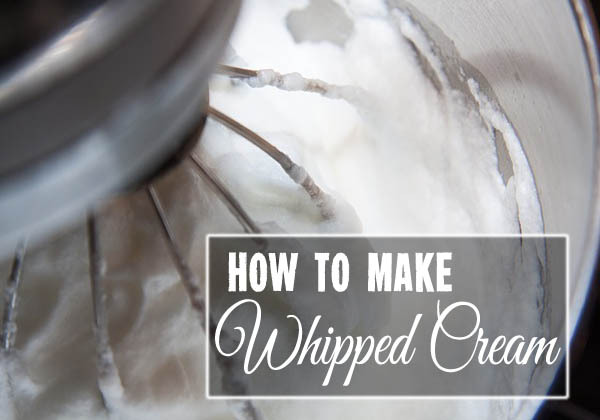 You can use any or many of these messages to thrill and bless your friends and family. More than sending and receiving these messages, Puthandu is a time of connecting with people and celebrating a joyous day, far away from the stress and mad rush of life.